This poem has been written by William Wordsworth. He is known as the poet of nature. Most of his poems describe nature and its beauty. 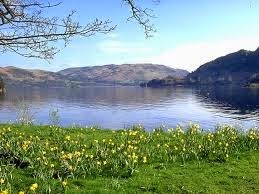 In this poem he describes an experience of his life.Once he saw a crowd of daffodils flowers beside a lake. The flowers were moving and dancing in the cool breeze.He was delighted to see this beautiful and charming sight. As a result, whenever, he is alone and in a sad mood the same sight comes into his imagination and fills his heart with pleasure. This experience has become a permanent source of pleasure for the poet. He says that daffodils are a bliss of solitude for him.In short we can say that this little Poem is a master piece of the poet.